Millets and sorghum are grains that are nutrient-rich, drought-tolerant crops and can support communities around the world. The International Crop Research Institute for the Semi-Arid Tropics (ICRISAT) estimates that more than 90 million people in Africa and Asia depend on millets in their diets, and 500 million people in more than 30 countries depend on sorghums as a staple food. However, in the past 50 years, these grains have largely been abandoned in favor of developing more popular crops like maize, wheat, rice, and soybeans. 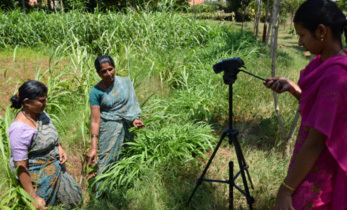 The Smart Food initiative at ICRISAT, in partnership with Feed the Future’s Accelerated Value Chain Development (AVCD) Program, is developing innovative methods to make these grains attractive again in the semi-arid tropics of Africa and India. 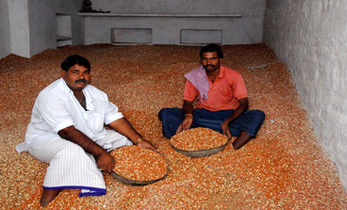 At the same time, the project is hoping to educate consumers, farmers, food processors, health workers, and government leaders about the various benefits and uses of millets, sorghum, and grain legumes. Building awareness of these grains can support the diet diversity, well-being, and livelihoods of rural communities and farmers in Africa and India, where undernutrition, malnutrition, obesity, and anemia are common. Millets are gluten-free, are high in protein and antioxidants, and have a low glycemic index, which can help prevent or manage diabetes. 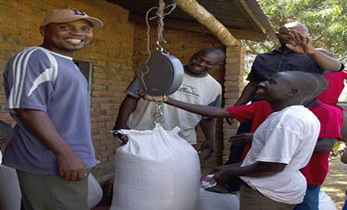 Pearl millet (pictured left), in particular, is very high in iron—one of the most common micronutrient deficiencies worldwide—and has twice the protein of milk. 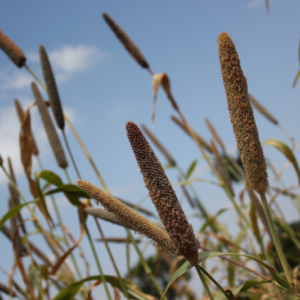 Finger millet has three times more calcium than milk. Kodo milletincludes three times the dietary fiber of wheat and maize, and ten times that of rice. Sorghum (pictured at top), also used as a sweetener syrup, is rich in vitamins, minerals, protein, and fiber, and is also gluten-free. This cereal grain can help reduce the risk of certain cancers, as well as aid in diabetes control and prevention. 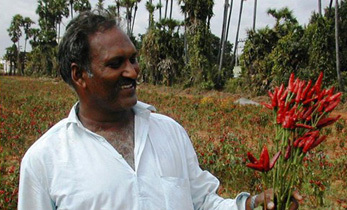 The current lack of development of millets and sorghum crops allows for substantial potential in growth and innovation. 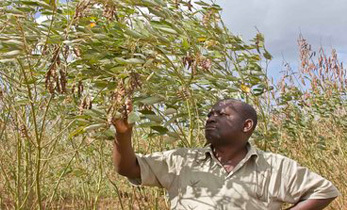 ICRISAT hopes to develop the crops’ value chains from farming to food products. “We are working with food processors to incorporate millets in ready-to-eat snacks and foods such as breakfast cereals, malt drinks, etc.” says Dr. David Bergvinson, the Director General of ICRISAT. Some of ICRISAT’s other Smart Food projects include healthy cooking demonstrations and training programs for Kenyan women and families; a Smart Food reality TV show, which challenges contestants to incorporate millets, sorghum, and grain legumes into meals; and a program that adds millets into mid-day school meals in India. Restaurants and food companies such as Slurrp Farm in India are beginning to incorporate millets and sorghum into their everyday meals and food products. Millets are multi-purpose—their stalks can be used not only as grains for human consumption, but also as animal fodder, as a biofuel, and in brewing. Other major crops like maize may see reducing yields or reach a yield plateau over the coming decade. However, ICRISAT reports that some millets and sorghum varieties could increase their yields up to three times their current potential. ICRISAT has found that millets and sorghum can be more reliable crops for farmers in spite of dry, hot conditions because they are usually the last crops standing in droughts. 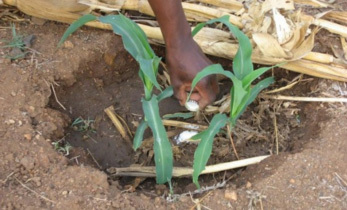 Not only can millets grow in about half the time of wheat, using few or no fertilizers and pesticides, but they also require 30 percent less water than maize and 70 percent less water than rice. 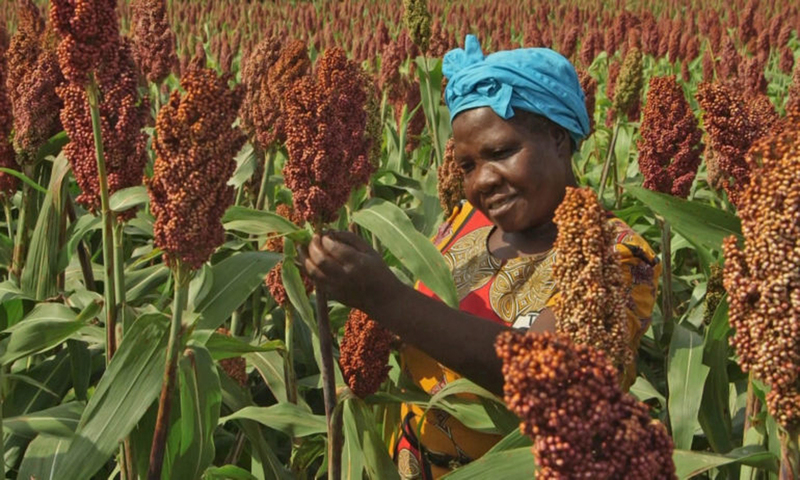 In the face of global climate change, water scarcity, and longer periods of drought, millets and sorghum may be valuable, nutritious, and hardy alternatives to provide sustainable food security for people living in increasingly dry climates. According to Kane-Potaka, a return to millets and sorghum means a return to food that is good for you, good for the planet, and good for the farmer.